We absolutely LOVE comfortable clothing. What is so comfortable, fun and much more affordable than other pants? The best leggings for women, of course! To be honest, if we could, we would wear leggings or yoga pants 24/7 (or maybe you could, we just don’t know how suitable that would be at work)! Either way, so you need help finding the most comfortable and good quality leggings? Don’t we all! Luckily we have listed the most value for the price, together with a review, right here! So, we have made an easy to follow list that contains amazing leggings, to make things easier for you. However, further down you will find a brief review of every pair and their features, to help you choose the right one and what you are about to buy. Enough with the talk, let’s have a look at the list of the top leggings. Fashion is just as important as function nowadays. If you look good, you feel good! When looking for great leggings, you don’t want it to get distorted when worn or washed. So quality is essential here, in both fabric and print. It’s important that the clothing material is soft and comfortable, but also thick enough not to see thru! We are talking about some weight to the material, not too thin or flimsy, and not the bulky or heavy either. It’s thick, comfortable, and high quality fabric allows you to move unimpeded in your daily life—that’s why the brand ViV Collection has been our top pick. This pair from the brand Leggings Depot with primary colors are super comfy and buttery soft to the touch. They also offer some amazing variation in colors in their collection which is worth checking out! A fun fact with this brand is that their products are a little thicker in the fabric, but it’s still an enjoyable feeling to have on hot summer days. However, they are not see-thru at all, which is an essential thing on one colored leggings. To sum it up; the fit, the price, and the cute colors make this a solid buy! These basic leggings can be a fun and cute addition to your style, and also one of the most suitable pair for work as they are simple. The vibrant and bright fabric will instantly take your outfit to the next level, and it looks good with almost every outfit. You will be pleasantly surprised by this pair as they are super soft and lightweight. Fashion and function do coexist in these with a very reasonable price. Popular leggings tend to be a challenge to find a suitable design, however, these have solved this issue! A lot of designs to choose from, for a cheap price. VIV Collections offers some amazing pattern on their products, and is actually, cheaper compared to other brands in the same quality range! The stitching is great, and the patterns are bright and clear. Works perfectly under a dress or tunic, as the wonderful designs really can complete a look. The material is buttery soft, and they fit well with a good form. A big plus for the wide range of beautiful patterns they have in their collection! Viv is one of the most popular leggings brand right now and really is a go-to brand for many when it comes to leggings. It’s important to notice that they offer only two sizes, one for XS – L and one for plus size leggings, which is L – XXL. However, when they say one size fits all, they really mean it. It’s worth mentioning that some customers report that they run somewhat small. But leggings per se are thankful for this as it’s a stretchable clothing and the fabric is meant to stretch to your fit. Other than that they are not tight to the fit as one might expect, just make sure to choose the right size (you have 50% chance of doing so). Due to the high waistband you will have support around your waist while moving around. These fleece lined leggings not only allow for beatable clothing, but will not leave sweat steins while working out. When looks are just as important as comfort, the brand Reflex got your back. This pair does a fantastic job at balancing breathability, comfort, and quality. As this is definitely one of the most popular on this list, that’s some a great feature to achieve. Lots of colors in their large collection of products to choose from, that goes amazingly with a pair of sneakers. With great customers reviews, it holds up to the bigger brands. However, we can’t help to be amazed by the designs, which are as important when it comes to leggings or yoga pants, of course! This pair has a high waist model that creates support and comfort while you wear them. Their collection mainly includes colors with vibrant colors and beautiful regular black. The fit is tapered to reach between ankle and calf, with a stretch that moves with you. Choose between the sizes small, medium or plus size. At this price point, this pair is a steal and could be one of the best affordable leggings on the market. This non see-through fabric and a elastic waistband for a snug, comfortable fit. Is not your typical training leggings, very light weighted and excellent for hot workouts. This amazing plain and simple leggings will not let you down. Exercise leggings are extremely trendy right now (as almost everything in the fitness genre). 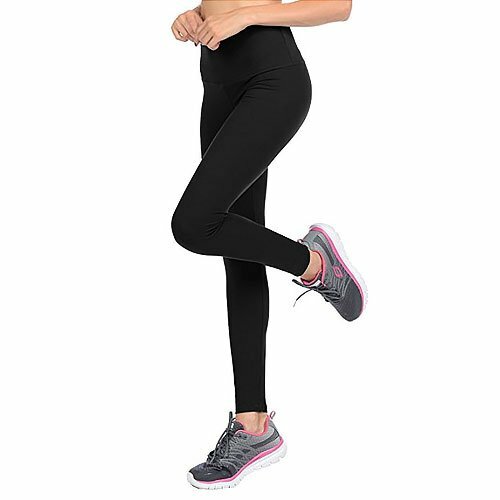 This pair is aesthetically pleasing with its complete stylish, sporty look and clear colors; it might very well be one of the most popular exercise leggings right now. The fabric is light weighted, firm and flexible. Perfect for intense sessions! With its medium thin and weightlessness material, it will be perfect for warm days in the spring and summer, yet feel good in the fall. However they will not keep you warm, as you might already expected. They are design to breath. This pair is also one size fits all and will hold up for heavy use. Quick review: very comfortable and fitting for the gym. You will be an eye-catcher with a casual-cool look! Totally worth checking out. One of the softest printed leggings we came across, as mention before, VIV really has an affordable price. Often compared to lularoe leggings! You will definitely not be disappointed in one of these leggings with a high waist. It’s the same fabric as the ones above. This printed gorgeousness is comfy and soft to the touch. The color of the prints is very vibrant, and they offer over 30 different designs to choose from, yes 30! This is one of the cheaper in this list, but with great customers reviews it holds up to the bigger brands. That’s a great reason to order several pairs at once on amazon, and as a bonus have some variation to choose from. These smooth and soft stockings are a prime example of study and light combined with a good price. The seams are usually sewn well which is common for the brand Viv, and the waist band is shorter than usual. Then, for example, a pair of Yoga Pants that have a higher waist band. With a shorter one, you can hide it and it will be more for outfits than an exercise clothing. To sum this pair up; high elasticity! Perfect for any type of physical activity. Incredible comfortable to wear with a unique and faded print. These yoga pants have more of a sporty look, perfect for exercising at the gym, running or obviously yoga. Vesi Star offers this fantastic fade pattern with several other colors to choose from. The fit on these are absolutely perfect with a high waist, and the fabric is a little thicker than some of the others on this list. Which makes them extra soft of course! Here we have gone up slightly in price, but with high-quality fabric and fit you won’t get disappointed. Vesi Star is known for theirs good customer service; you will most likely be taken care of in excellent service. The fit compress with a nice stretch in all of the right places. They offer unlike many other, individual sizes and not one fits for all. The sizes range from extra small all the way up to extra-large, they also offer plus size products. Some customers report the sizing is somewhat small, but that it usually, won’t be a problem when it comes to clothing that stretch. One of the best women’s workout pants for a quite nice price! Step up your fashion game with these creative prints and patterns. Style your leggings for any season, style, or occasion! The brand Sejora offers some clothing that is fashionable and eye-catching for a good price. They are specially designed to be super comfy, ultra breathable and soft against your skin. Overall these are a great deal with multiple designs to choose from. If you generally stick to a one colored outfit, these can convert you to printed ones! They add a little flair to your fashion for sure with a more minimal and clean design, the possibilities to construct your outfit with these are unlimited. They are cheaper than many other premium products but with an equivalent quality, still soft to the touch and comfortable to wear in your everyday life. If you usually wear solid black leggings, these could be your first step towards patterned ones. This pair is also breathable which will be a grateful feature during the hot summer months. They are not see-through at all and are another high waist model. With that said, this pair looks amazing on with a comfortable fit, and you will love the proper amount of support and coverage it deliverers! These modern leggings with many designs to choose from are an excellent fitness pair. The fabric is extra thick and will keep you warm even at out doors. 90 Degree is a high-quality brand that holds up after heavy wear. Designed for an active life style, the fabric is extra soft as it has some thickness to it. Their products have some clear and creative patterns which work perfectly with a nice pair of shoes or sneakers. A nice extra bonus with these is a hidden waistband pocket; perfect for stashing hair ties, clips, keys, cash, etc. Totally underrated feature if you ask us! These yoga pants have great stretch, and the flexibility will not be restricted in those at all. The fit is just as suggested and are very comfortable to wear. Worth mentioning for high-intensity workouts as in jump squats etc. You will probably spend your time adjusting them as they are meant as comfy yoga pants. However, they are perfect for Pilates, yoga, walking or even running! These leggings have some of the nicest flower prints out there. You should definitely check out their prints if that’s what you’re after! As most of the products in this list, they as well offer a wide variety of prints. This pair is soft and stretchy with beautiful clear colors. They have a little smaller size which makes them stretch correctly but doesn’t feel tight on your legs. Other than that, another high waist model on the list. Flower print leggings are perfect for the spring or summer, and it works amazing with a cute top. The brand who manufacture these are called Depot, and they offer a nice variety of patterns to choose from. The only offer one size fits all, which is quite familiar with this type of clothing. Still, it’s worth noticing before buying. As well considering if you had good experience with that before. However, with the price of these, there isn’t much to complain about. The fabric is buttery soft to the touch and quite comfortable! It’s tough, comfortable, and designed to let you move comfortable —that’s why the brand Compressionz has been on our list for over two years. Say good bye to boring patterns. Compressionz has some seriously impressive clean designs; why not go with a blue leopard print for example? You have to check out their creative clothing. The material is soft and comfortable; the colors in the prints are very vibrant and bright. They are not seeing-true what so ever, as the fabric is medium thick. This pair is often compared to similar products in a much higher price range. A nice little bonus detail with this pair is a zipper pocket in the back. Perfect for storing your most essential and important things while taking a run or walk. The zipper will prevent things from escaping during intense movements. The fabric is quite tight but still stretchy, and the will hold everything together well. Comes with a high waistband that can be folded if one prefers. Overall, excellent quality with dull or even matte colors which is not shiny at all. Stylish leggings with a fit that are durable, elastic and with bright neon colors. Do you miss the 80’s and their colorful splatter designs? Then these will be the perfect choice for you! X80 Neon Splash will definitely get you noticed as you pass by in its colorful design. Works perfectly for a themed party or just adding some color to your everyday life. Leg warmers would really complete the look with these. Just be creative! To make it short; beautiful multi colored leggings yet very clean to the look. This pair runs true to size and fits very well; they are smooth and comfortable as a pair should be. These are cute and fun tights that feel a little like spandex fabric, but with a cotton mix. So they not actually absorb moisture very well; therefore it’s not recommended for exercise or training clothing. Running might work when it’s not too warm conditions, as they will stay sweaty well after the workout are done. Recommend using for dressing up your outfit and parties, and you will get compliments on these! The unique power fabric provided by Nike gives you compression and support in your active lifestyle. Nike Power fabric offers excellent compression and support for your active life. The material is the perfect thickness with “mesh panels”, which enables breath-ability and airflow, just wow! This is some serious innovation for the comfy life style lovers. However, it comes with a little higher price. Nike is more expensive than the others, but if you are looking for one of the finest you can find. Nike knows what’s up! Anyway, the print is beautiful and in high quality. This pair has an excellent high wasted model, and a high waistband to top it off! This pair fit great! Not too tight or loose fits as expected in other words. Nothing else would be expected from Nike. However, this particular model has a skinny fit through hip, thigh and fits perfectly with skinny legs. The design is unique with its swirls of colors splashes. If one doesn’t like it in black, they also offer it in, what they call it, the color “Obsidian.” This is a beautiful blue color, worth having a look at. These good quality capri leggings will give you freedom at every turn. Finally some work out carpi’s without the hefty price tag. This light-weighted Capri legging is quite fantastic to wear, and it’s perfect for working out at the gym or for running. Especially under warm summer months as they will cool you down more than regular pants. They will cover a little below your knee which is the ideal length for this type of model. This pair is made of highly durable fabric that will fit well and keep you dry, with surprisingly a very reasonable price – and that we love! Champion have around eight patterns to choose from, so make sure to check them all out. The sizings come with x-small all the way up to x-large, so there are plenty of sizes to choose from. Champion has really gone the extra mile while developing these; power flex is the new apparel that offers a close to body fit. The stretchable fabric will move with your full range of motion. This one works for almost everything, even highly intense workouts. With their moisture technology that wicks moisture away from your skin, you can feel comfortable even after your exercise activity. Comes with a high waistband as well and the sizing is true to fit, base your decision on what size your regularly buy. Anyway, an amazing pair that will last you long for an excellent price! Before buying or considering a new pair of leggings, you must have a good understanding of its functioning areas, sizing, and quality. These three will most likely be different with each brand. It can be quite hard to find good clothing that will match all these when you are looking for the perfect ones. Especially if you considering a low price as well, leggings often can go up quite a bit in price without any particular reason except brand recognition. You see, the clothing item itself must not be that expensive to manufacture. It’s not very uncommon these products are imported. However, between quality and function, there could be tons of variables that are important to you. As we’re looking at printed leggings, design and print is, of course, an important aspect as we choose our products. Leggings can often be mixed with the other clothing item, tights. As they both are close-fitting clothing, you can’t be blamed. But it isn’t the same thing as tights as they often are much thinner in the fabric, and do not absorb moisture. Leggings made its break thru during the 70’s and 80’s, and nowadays they are well established in the fitness, fashion, and street wears genres. In recent years have Capri-length leggings being worn more frequently. This trend with tight and stretchy pants can alternatively come from the era of skinny jeans which were, and are quite popular. However, leggings made a comeback into the high fashion, and it looks like it’s here to stay for a while. With the introduction of women’s top rated leggings, the possibilities opened up for a new audience, where fashionable clothing is in focus. For example printed leggings or vibrantly colored where nowhere to seen just a couple of years ago. It’s important to maintain the quality of the clothing, so it was last a long time. To make sure you’re taking the best care of your newly acquired leggings we made this little guide on what to do and don’t! For those who didn’t know, this may be a rather inexpensive clothing item, but we ensure you that you will save money in the long run by taking good care of them. Especially if you want to maintain the stretch in the fabric. Which is kind of the point of leggings in the first place! Of course, rule number one. Always check the label inside your clothing before going any further. Read the instructions and follow them. However often it will not tell you about how to wash and dry it. When washing, you want to minimize the destruction of the stretching. We will go more into details on this later, but as a rule of thumb never use hot water, instead use warm or cold water. No worries they will get clean this way too, and too hot water can make your colorful prints washed out. Also, preferably put your clothing in a mesh bag like regularly do with lingerie. This will avoid it to getting tossed around and tangled into other clothes in the washing machine, which otherwise can hurt the stretching of the fabric. Without knowing what the specific brand of yours is saying, leggings often have a particular material that will keep you dry (it’s a good thing by the way). This can result in the fabric getting quite damp after being wet. Like in the washing machine for example. So it’s vital you dry you leggings after washing before you put them in your closet. Leggings generally dry much slower than regular clothing, like t-shirts or sweaters. Recommended is to hang up your clothing to dry and let the air do the job. They will last much longer this way. In other words, avoid dryers as much as you can. Always let them air-dry instead; it can be okay to use the dryer occasionally. But it may mess up the fitting of the product and sometimes distort the print on the cloth. Also, the high heat can damage the stitching of the leggings and eventually rip or tear holes in the clothing. Hang-dry for best results, in the sun, works fantastic! Why is it so important to think about this? Yes, because leggings are usually manufactured with 90% nylon which is often not so good with high heat. Last but not least, you are looking after full comfort when you fit leggings. This can often be achieved by knowing your size. Check your size of other bottom pieces of yours and convert to other measurements if needed. This will make shopping online so much easier! If you keep these tips in mind, you are likely to find great products that won’t let you down. Considering how the market of leggings have evolved during the last past years, it’s getting pretty saturated to say at least. This clothing item was generally worn during exercise, like running or walking. But have evolved into a fashion and style piece, with the introduction of graphics and patterns we can clearly see that the purpose of the clothing is now also visually. It has become a part of our daily wear, just like jeans for example. While this genre of clothing is growing day by day. You will soon notice finding perfect and high quality pants will be a relatively hard task to do. That’s why we made this list of high quality products! Do keep in mind that quality often follows your budget, but it’s not always the case. So always check out reviews before buying this amazing invention. So these where our top picks then it comes to leggings for women! After looking at pretty much every affordable brand we could find, the one that managed to stand out to us the most, was VIV Collection! Thanks to the the super soft fabric, great reviews, and overall great comfort and high quality. In case we left out a brand of leggings, don’t hesitate to contact us.